We went to the truffle capital of Istria, the village of Lipave, the hometown of Giancarlo Zigante, who ten years ago discovered the world’s largest truffle. He went on to start a truffle company and we went to the Truffle Festival last weekend. The entire area is now famous for truffles. Truffles are mushrooms that grow underground on or near the roots of trees. They have a very strong odor and are found with the help of trained dogs. They are also one of the most expensive foods in the world and we wanted to see what the big fuss was all about. We went to Zigante’s Restaurant try it for ourself. 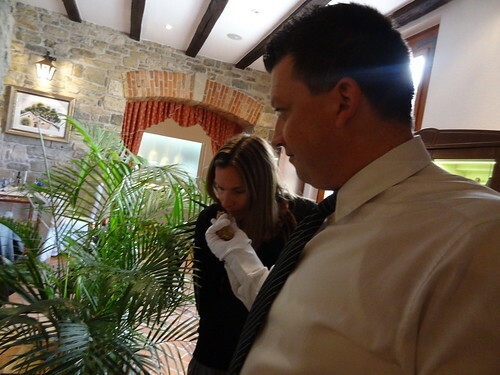 The truffle expert in the restaurant, shown above letting Nadia smell the truffle, was explaining that his trained nose can discern when a truffle is “interesting” and ready to be served. Truffles are kind of like wine, a palette of great adjectives is all you need. 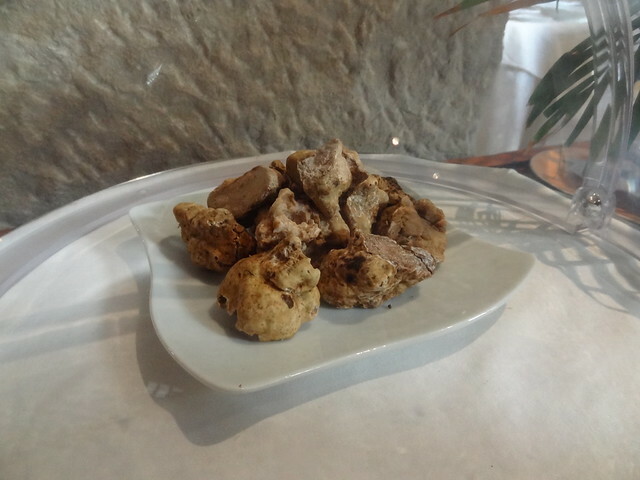 He selected a white truffle (shown below) and brought it over to our table. He sliced the truffle into thin pieces over our dishes with a special truffle “slicer.” They are served raw lightly over the dish. The guy said simple dishes are best to eat with truffles so the taste can come out. I had noodles with cheese plate and Nadia had pumpkin ravioli. What did the truffles taste like? I thought it was like a strong, pungent, taste and smell, kind of cheesy or like garlic. Nadia and I both agreed that it wasn’t worth the cost and we don’t see why this mushroom is so sought after. I wouldn’t have them again. 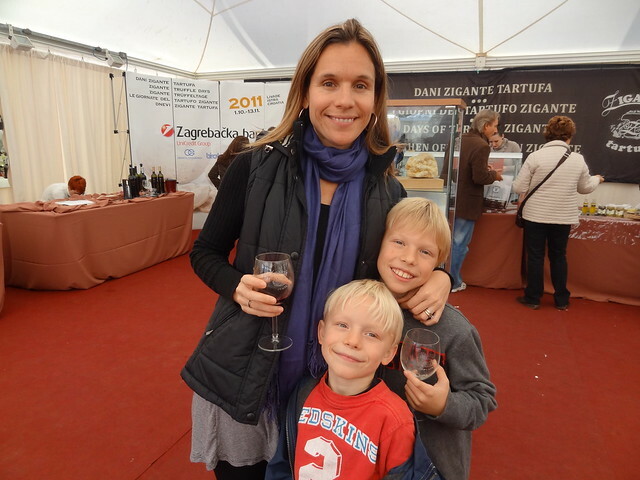 We did enjoy sampling and buying the local wines that were also at the festival. We bought several bottles of the Istria grape varieties, the Malvazija (white) and Teran (red), and both were very palatable. I would especially recommend the “Ana Antonija Teran 2010, from the Benazic Winery. The prices were great, too. Owen and Oliver loved the glass rinsing machine that we used between sampling the many wines on display.